Aren’t Sarah’s soaps gorgeous? Pictured above (left to right, clockwise) are Sarah’s “Summer Lovin'” soap, “Sweet Dreams” soap scented with lavender, Mustache soap scented with Shave and a Haircut Fragrance Oil, and a beautiful Asian Pear and Lily soap. Not only does Sarah make lovely soap, she also sells candles, baby onesies and baby blankets. 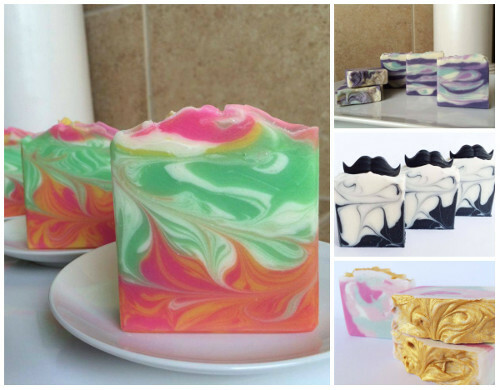 She is a crafter extraordinaire, and we are happy to have her in our soaping community. Expect a soapy package coming your way, Sarah! Post pictures of your crafty creations on the Facebook page each week for a chance to be featured on the Soap Queen blog and receive a sweet soapy package from Bramble Berry! I would love to have her talent. I etsy stalked Sarah’s page and her soaps are beautiful. 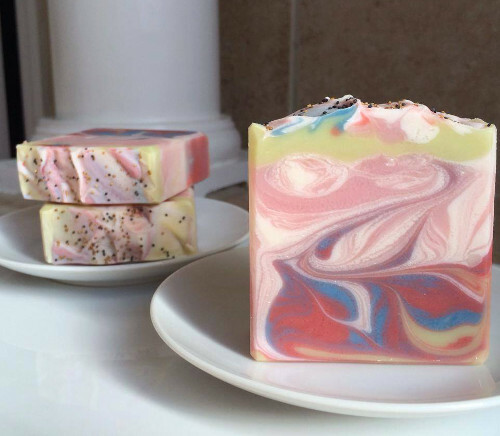 Love how you swirl you soaps, keep up the great work. I’m so glad you love Sarah’s soap as much as we do, isn’t it gorgeous? Happy you liked this post! WOW! Thank you so much, Anne Marie! This was such a wonderful and exciting thing to wake up to! I love using Bramble Berry supplies in my soaps. In fact, it’s the first place I ever ordered supplies from! I still love getting Bramble Berry boxes in the mail, it’s like Christmas every time. Your supplies are top-notch and the customer service is impeccable. Thank you again for your kind words and for noticing our soaps! I look forward to ordering from Bramble Berry again in the future. Keep up the good work! I’m so glad it was a fun surprise for you, we absolutely love your soaps and are so happy to have you in our soaping community! 🙂 Can’t wait to see what you make next! Man what a cool bunch of soaps! I wish I could be Facebook photo of the week but sadly I don’t have a soap business. Just a blog 🙁 For now at least! I’ll try to stick to those new year revolutions! We still love seeing soap from people without a soaping business 🙂 Hope to see some of your creations soon! That soap is just amazing : ) Can’t wait to soap again!! Hello Anne-Marie and everyone from Bramble Berry : ) Happy New Year!! Glad you liked seeing Sarah’s soap, she is a true artist! Happy New Year to you as well!